Looking for a fast and fresh veggie side? Our favourite spring vegetable gets an Asian twist! 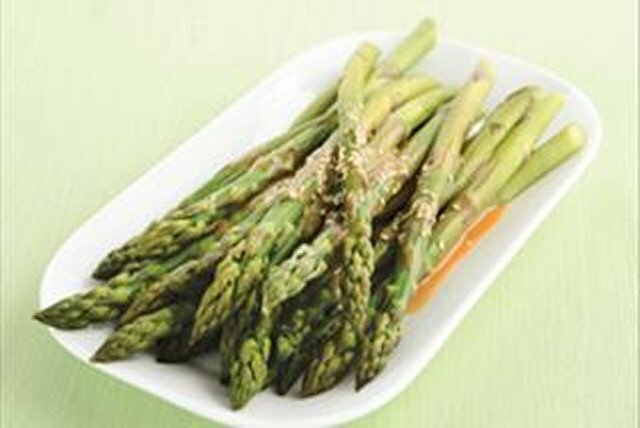 Quick-cooking asparagus is topped with a soy-ginger dressing for a simply satisfying veggie side dish. Add asparagus, soy sauce and ginger to saucepan of boiling water; cook 5 min. or until asparagus is crisp-tender. Drain. Transfer asparagus to serving dish; top with dressing and sesame seed. Choose asparagus spears with closed compact tips, round stalks and a rich green colour. This Asian-inspired vegetable side dish can be part of a healthful eating plan.